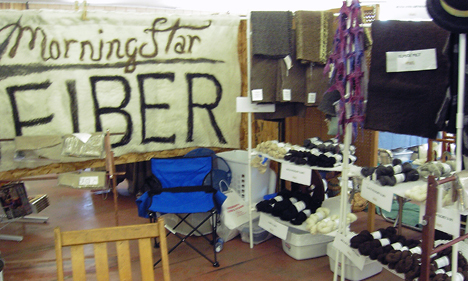 i’ll start off with some knitting today—since i actually DID do a bit of knitting at wooster (but strangely, did not do much of it at home this weekend. 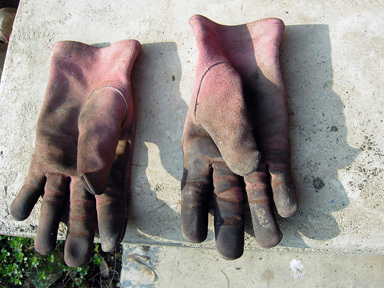 hmm—well, that’s gardening for you). 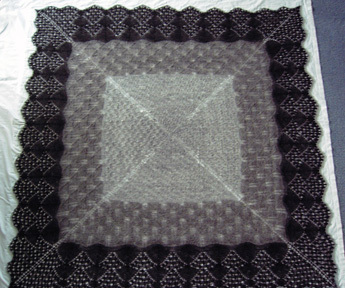 the ghist of it all is that, for some people whose kitting is uneven between knit and purl rows, the combination technique will help even it out. 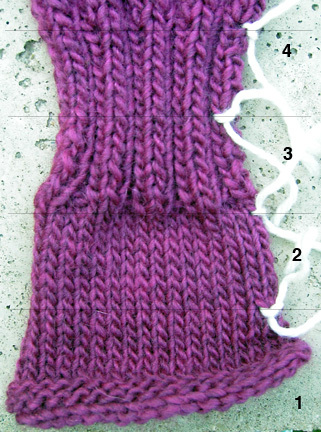 likewise for the vertical unnevennes we sometimes get in ribbing, between the knit rib and the purl rib. there are also special techniques for increasing and decreasing. in the swatch below, the new technique was practiced in sections 1 and 3, and my usual technique in section 2 and 4.
using the new technique caused a little unnevenness in my stitches that wasn’t there before, especially in the ribbing, but i’m sure that would disappear with practice. or, maybe i don’t need the new technique, but i did notice that in the ribbing, i did not get any vertical gapping between ribs, a problem i sometimes have. and though i do not see it in this swatch, sometimes my stockinette rows are uneven, depending on the yarn and needles used. so i would definitely use combination knitting if i were experiencing those problems. the other class was to learn to cable without a cable needle, and let me tell you, i am SO ready to not use one any more! i love doing cables, but they slow me down, which i do not like. 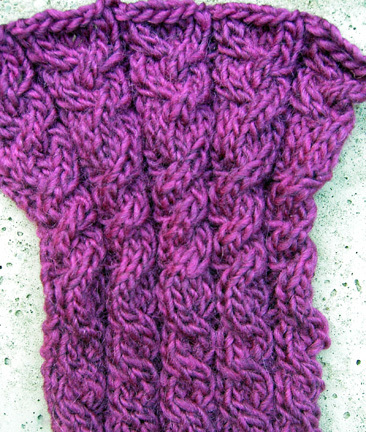 i had previously taught myself to do some twists without a cable needle, but my technique was limited to cables with three stitches or less. here we did left cross and right cross cables as well and a braided cable. annie’s technique is MUCH better and i will use it a lot. it is definitely more suited to knitters who are very comfortable with their tools and with working stitches OFF the needles. it will save time and i will put it to use on that tangled ropes cabled pullover i started in february. 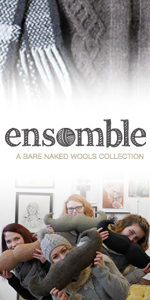 i haven’t tried it yet with cables larger than 4 stitches, but i will keep you updated. between classes we had a break, and we got to look round a little more. 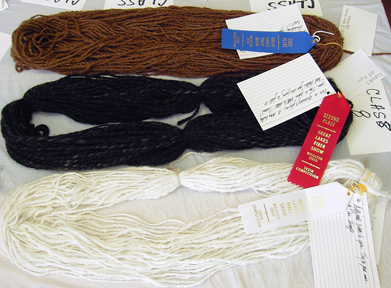 we mosied over to the skein competition to see what examples of handspun yarn had been entered and if the judging was done. as you can see, the results were in! 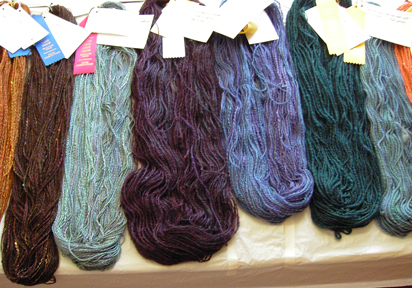 i (obviously) so enjoy examining the entries to skein competitins! 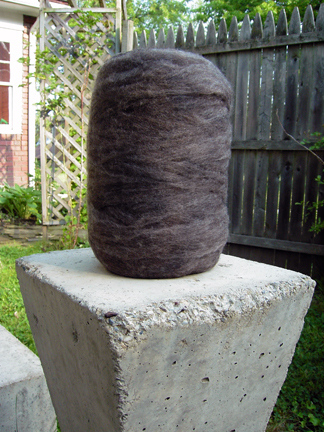 spinning is more than a fiber interest for me—it is a both scientific and archaeological journey as well. it is an endeavor that just feels right for me on every level. 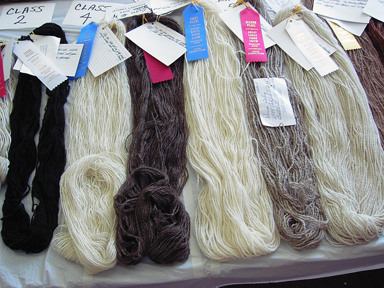 being able to touch and closely examione other people’s spinning is a thrill for me. what can i say?? you know i’m a geek! after the second class, the day was over and we headed home, but no trip from wooster is complete without a stop at the Dalton Dariette, so we succumbed. mm—french fries for lunch and soft ice cream for dinner! early sunday morning i went back, to get some quiet time with vendors that i thought really stood out. i took some extra pictures, chatted with them, and made plans to interview them in the future. here is a brief overview of a few i did not already mention, with more in-depth coverage to come. which i had not heard of before, but fell in love with immediately. 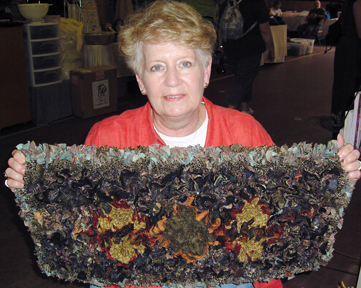 she had a small piece there that i am coveting, but which i KNOW she will never sell. i had a lot of questions about gloria’s artistic process, because the concept of wool fabric as a painting medium, was one i found captivating all of a sudden. 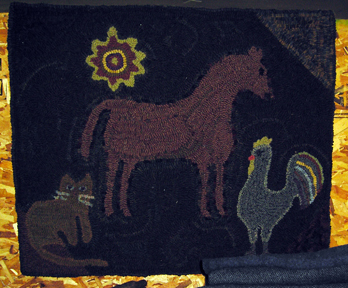 mind you, i had never really given rug hooking a second thought before, so gloria, you have made a convert out of me! i am looking forward to a future interview with you! 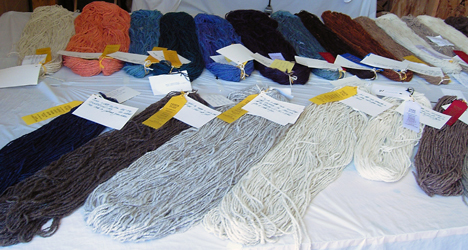 last year i had purchased some icelandic thel fiber from karen, which i spun into yarn for the middle tier of the wooster shawl. 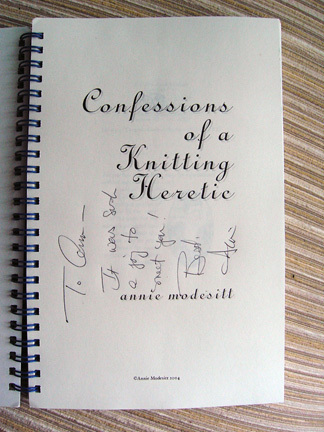 i decided to get some more of that because it was both enjoyable to spin and a pleasure to knit. since her parents sold their flock of icelandics, this might be the last i get for a while! 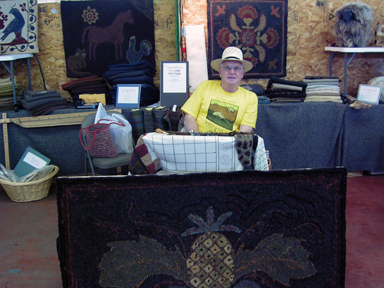 it was time for me to move on to my last stop, a visit with Walter Turpening, a furniture builder who specializes in made-to-measure chairs for fiber artists, as well as everyday home use. 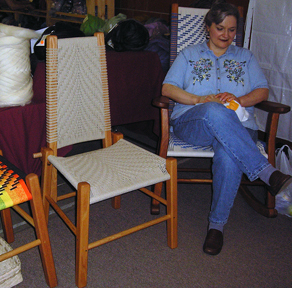 need a better-fitting chair, rocker, or bench for spinning, knitting, weaving, or just plain sittin’ around shootin’ the breeze? walter will hook you up. walter left his career as a technology developer make chairs as a lifestyle. 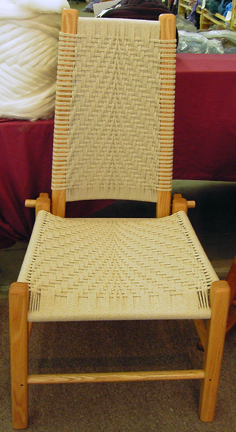 he fashions the frames from solid wood, and weaves the seats using designs based on mathematical functions. oh, i know i am going to get into trouble if i try to explain that, so let’s just say that walter appreciates the relativity of geekiness and applies it liberally wherever he thinks we will appreciate it most! 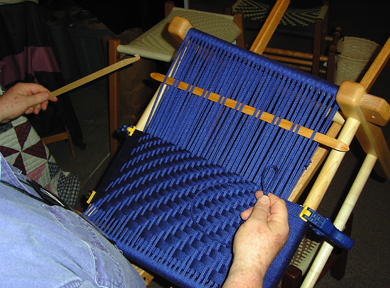 with the two-tone seat you see above, in the bench, giving walter complete artisitic freedom as to the weaving design. 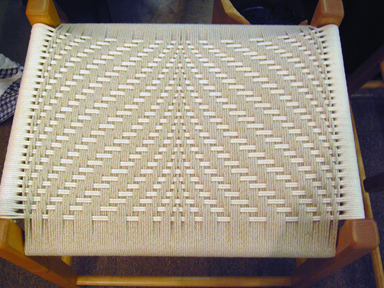 if, over the year it will take to be made, i can afford it, i will get the gradient gray seat weave i am lusting after (and which, of course costs QUITE a bit more!!). that seat satisfies my big danish modern heart, so i might just have to do it . . . but i will be patient and see what happens. in the meantime, i got measured, and then had a wonderful conversation with walter about the geeky aspects of his work (i love that stuff! 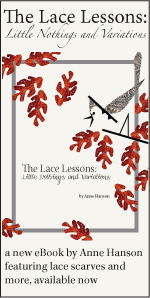 )—how he weaves the different cordings, how he decides on a seat design, etc. 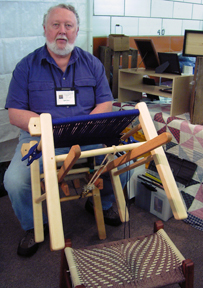 here is walter’s lovely partner seated in the knitter’s rocker. and that was it for me! i slowly walked back to the car and thought about everyone i had spoken with and all that i had seen. certainly, we landed in a place full of riches—it may have been accidental, but i feel as if i am right where i belong for now! back to the ranch, now, for some yardwork and daydreaming. All I can say is “YOU LUCKY DUCK”!!!!! OMG those chairs are beautiful…beautiful bikes (and you bike to work), beautiful chair (and it is for spinning)- I want to be you! 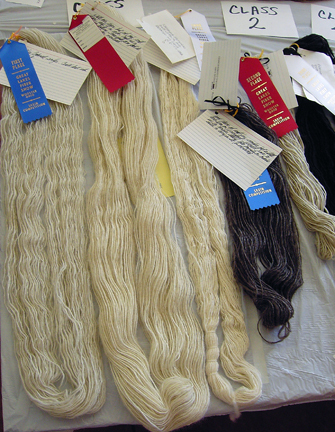 You should definitely enter those handspun yarn competitions — your yarn is beautiful! And, wow, those chairs are great.